The Shallow Man is an elegant but aged fossil. I’ve been around since the days when Madonna still made decent music when Mick Jagger claimed that he wouldn’t continue performing once he reached the age of forty. I can recall a young boy who used to sing and dance with his four brothers, whose talent shone out even then. I remember when having a color television set was a sign of affluence and can also recall when it was considered the height of cutting edge and dangerous comedy for a group of white men to apply boot polish on their faces and perform as people of color. That was a long, long, long time ago, which brings me to the subject of this article. Being the courageous person that I am, I will break the conspiracy of silence that overcomes this country every November to December. 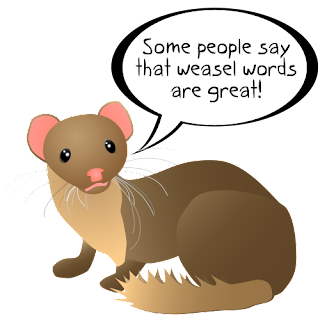 I will risk the unrighteous fury of the collective hordes of weasels, who every year attempt in new and creative ways to justify the unjustifiable. Yes, the Shallow Man will invoke the spirit of Aretha and the late great Otis Redding and demand some R E S P E C T and dignity for people of color and damn the consequences. The things I do for my readers! The Shallow Man is so incandescent with rage, that I will not even attempt to explain the annual Dutch celebration in too much detail. To summarize, quite simply an old man with a white beard arrives in the Netherlands every year together with his crew, a group of black faced, curly haired slaves who help him do his bidding. This event is huge here and is bigger than Christmas. Albert Heijn, Blokker, Kruidvat and many other big Dutch chains happily participate in the annual institutionalized black face event that is Sinterklaas. Take a look at the photo below. Hilarious, I’m white but I’m blacked up!! The increasing globalization of the world has in recent years finally reached the Netherlands. 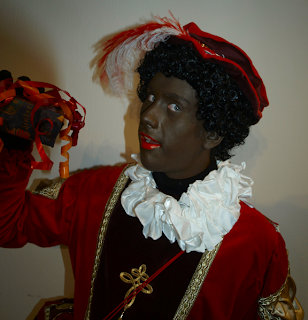 This has led to some slightly embarrassed revisionism on the part of the Dutch about their annual Black Face Fest. Apparently, the reason why the faces of Sinterklaas’ helpers are black is due to them going down the chimney to deliver presents to good kids or beatings to naughty ones. I’m sure that the image of people of color, carrying out a home invasion to beat kids hasn’t led to any racial trauma at all. But I digress. So if we are to believe the wise people of Dutch science, apparently if you start out white and blonde, sliding down a chimney will not only turn your skin black, but will give you bright red lips, and black curly hair. It will also affect the way you talk and give you a kind of mock Surinamese accent. It will make you jump around like an idiot and your eyes will roll as well. The Shallow Man was never particularly good at physics unless it involved a mirror, but I have to question the scientific credibility of this explanation. Whenever sensitive Expats such as myself question the annual let’s-black-up-and-be-jolly season, out come the weasels to defend the indefensible. So was lynching in the deep south of the USA, luckily the tradition stopped. Yes, of course, kids are kids and are too young to get offended and look forward to the presents. The one black person you know and probably speak once a year to is humoring you and would prefer not to have that discussion when he knows your views. Err, you said that already. Ah, the rational argument of the desperate. Absolutely not. I present the following Exhibits to the jury. Exhibit 2. 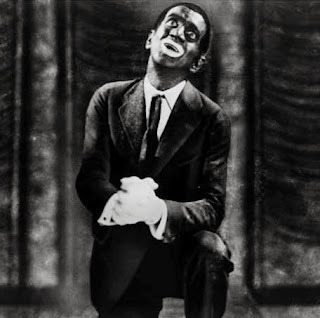 Black face American style from the 1930’s. Trick question. What do the two photos in Exhibits 1 and 2 have in common? I’ve heard many weasel- like attempts to justify the essential requirement to have hordes of white people wearing curly wigs, blacking up their faces and wearing bright red color on their lips. None of them are even remotely credible. Like Lynching, wife beating, slavery and racial discrimination in general, Zwarte Piet is unacceptable and dehumanizes people of color into figures of fun. Trying to cling onto some bull manure story about dressing up as the helpers of Sinterklaas is just nonsense. If the Dutch are such sticklers for historical accuracy, why do I do not see Dutch people nailed to a cross at Easter time? Or chopping off their ears on Van Gogh’s birthday? The reason this pernicious and demeaning event continues every year is that people find it fun. Fun to black up. Fun to laugh at people blacked up, and it’s ok because just about everyone in this country finds it Gezellig (Pleasant) and Grappig (Fun). Why not just admit it and stop the pseudo-historical justification that has no moral grounding at all? No morons in black face were hurt during the writing of this article.